It seems to be a popular ingredient in Asian (esp. Chinese?) food. I encountered them on pork spareribs, and some side dishes. Apparently it turns everything completely black when it is added. I can rule out soy sauce (which is too salty and tastes entirely different) and I realise that this question is rather vague. What additional information could I provide? and I think it's as close as it gets (perhaps the restaurant uses a slightly different version of the one I bought, as mine is a bit saltier and a bit less sweet). Update: I finally discovered the exact sauce I was looking for. It turned out to be Black Bean Garlic Sauce. Hoisin sauce, oyster sauce, and black bean paste seem to be the most likely culprits. What is the texture of the sauce? If it's smooth, it's hoisin; but hoisin tends to be salty. 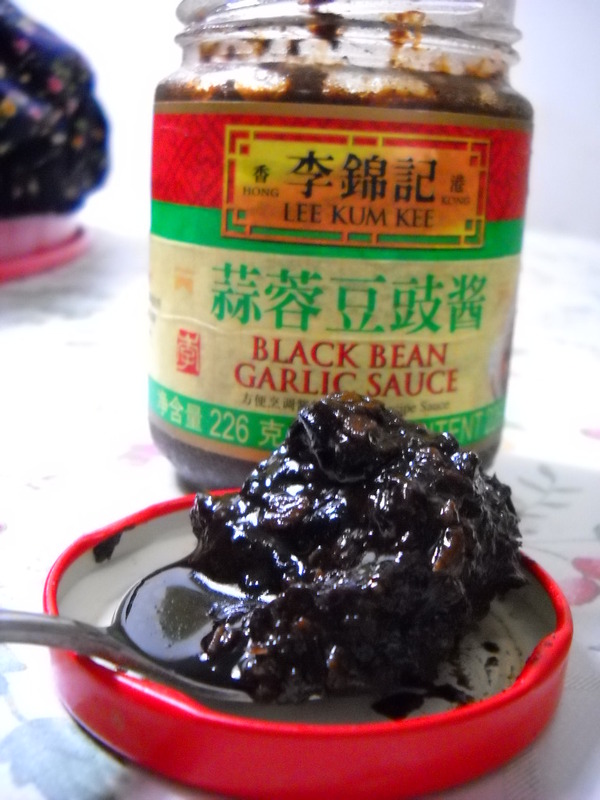 If it's not smooth, it's black bean paste. Oyster sauce is a little oilier than the other two, and is used in almost every Asian sautee. Two things spring to mind: it could be dark soy sauce, which is much less salty than light soy sauce. It's thick and very dark and is almost exclusively used for colouring, which sounds like the sort of thing you're thinking of. It could alternatively be black rice vinegar, which is much sweeter than normal vinegar, and in fact doesn't taste vinegary at all. The only thing I can imagine that would turn it black would be be black beans (or black bean sauce). It's often used with pork spare ribs as well. It isn't generally sweet though, so that'd have to come from another ingredient. Spare ribs are usually dressed with a combination of soy sauce, vinegar and sugar. A sort of sweet and sour sauce. The sugar will mask the salty edge or the soy sauce. It may also have been Kecap Manis, or other soy sauce. There are a vast number of soy sauces out there, some are sweet, some are salty, some are subtle, and some are very strong. They certainly do differ substantially in taste. Also, there may have been sugar added as well, even in addition to the already sweet Kecap Manis. Possibly molasses as a lot of recipes I've seen call for brown sugar which is often a substitute. However it could also be a combination, particularly with hoisin, that causes the result you're describing. If u encountered them on pork spareribs, and it turns everything completely black ,as well as it tatse slightly sweet..I think it just becuase the cooker flavored the pork spareribs with sugar and vinegar.I'm a Chinese girl,my family always flavored the pork spareribs in that way. Btw:at last,we usually mix a little soy sauce on it，just for the color of a dishes.